Who says a pancake breakfast can’t be tasty and healthy? 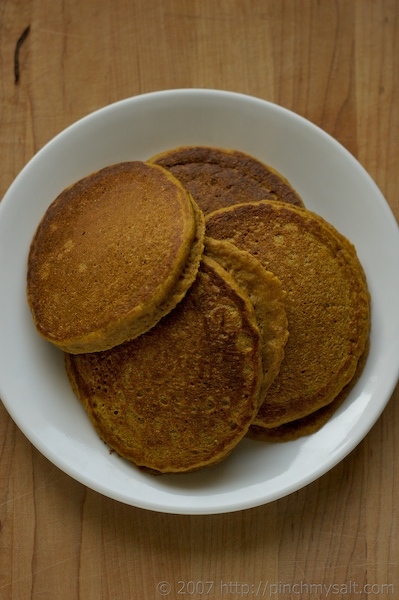 Whip up a batch of these Whole Wheat Pumpkin Pancakes and indulge your fall cravings for foods that are warm, spicy and sweet. Your house will smell like pumpkin pie, your taste buds will think you’re eating something sinful, and your body will thank you for filling it with a wholesome meal! I had been planning on making french toast for our Sunday morning breakfast. I had baked some really good buttermilk bread the other day and the last half a loaf is at that ‘too stale for cold sandwiches but perfect for french toast’ stage. So what is that photo of whole wheat pumpkin pancakes doing up there? Well, this morning I did what I do best. I changed my mind. Just as I was pulling out the milk and eggs for french toast, I had a vision of pumpkin pancakes. This was odd because I’ve never even tasted pumpkin pancakes, much less made them! But once the idea was in my head, I couldn’t let it go. I announced to my husband that breakfast plans had changed and that he would be eating pumpkin pancakes as soon as I figured out a recipe. He gave me an uncertain look that said he was hungry and worried that my ‘pancake experiment’ would delay breakfast for quite some time. But he knew it was useless to protest and muttered something like, “That sounds good” and went back to playing his latest PS3 game. I was hungry too, but confident enough in my pancake-making ability to take the chance. I had a feeling I could throw something together pretty quick and on the off chance it turned out to be a disaster, french toast was still an option! When I was a kid, I hated whole wheat pancakes. I thought it was bad enough that we were only allowed to eat whole wheat bread when all the other ‘lucky kids’ at school got to eat sandwiches made with Wonder bread. I didn’t think the dreaded whole wheat flour had any place in my breakfast pancakes! Pancakes and waffles were one thing that my parents made with white flour and therefore they were just like the pancakes my friends ate and just like the pancakes I could order at a restaurant. And that’s the way I liked it. We didn’t eat pancakes at home very often but they were (and are) a breakfast staple up at the cabin. Plain pancakes, banana pancakes, blueberry pancakes, gooseberry pancakes, and even corn pancakes. But never whole wheat! The few times I had to eat whole wheat pancakes growing up, I thought they were absolutely terrible! Maybe they were, they certainly can be if you use the wrong recipe. But I think it was probably all in my head. My views on whole wheat bread changed over the years as did my views on whole wheat pancakes. I’ve learned that many types of whole wheat pancakes actually taste much better than regular ones. So, even though I’ll always love a stack of good old white flour buttermilk pancakes, I find myself experimenting more often with different types of whole grain pancakes. Pumpkin pancakes seemed like the perfect vehicle for whole grain flour so that’s what I used in this recipe. I added a little bit of cake flour to lighten them up a bit but feel free to try the recipe with 100% whole wheat flour if that’s what you prefer. This recipe will use about half a can of pumpkin puree. If you have a large family, double the recipe and use the entire can. One can is just under two cups of pumpkin but don’t worry too much about not having enough pumpkin. Just use one can and add a bit more buttermilk if the batter is too thick. If you aren’t going to make a double batch, use that extra half can of pumpkin to whip up some pumpkin muffins! 1. 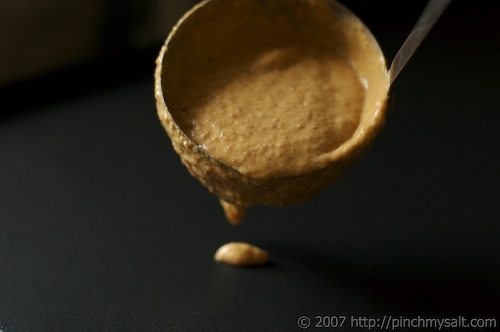 In a large bowl, whisk together the first eight ingredients (whole wheat flour through nutmeg). In a separate bowl, whisk together the last six ingredients (buttermilk through brown sugar). 2. 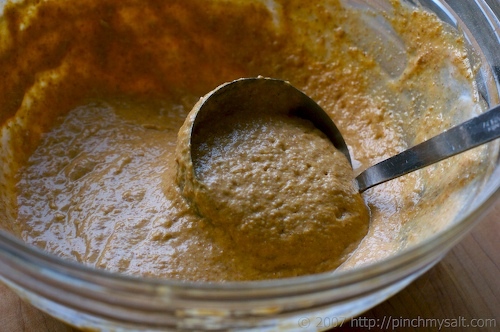 Pour wet ingredients into dry ingredients and blend together with a wooden spoon until just combined. Lumps are ok, just make sure all the flour on the bottom of the bowl is mixed in. If batter seems too thick to pour, you can gently stir in a little more buttermilk. 3. Drop pancakes by ladleful onto a medium-hot griddle. Pancakes are ready to turn when the edges start to look a little dry and you can see small bubbles forming on the surface. You may substitute all-purpose flour for the cake flour. You may also use only whole wheat flour, just increase whole wheat to 1 1/2 cups and omit cake flour; pancakes will be a bit heavier. Light brown sugar or white sugar may be substituted for dark brown sugar. If you have it on hand, 2 teaspoons of pumpkin pie spice can be used in place of the cinnamon, ginger and nutmeg. Hey Nicole How was ur vacation? Looks like you had loads of fun:). Pumpkin Pancakes looks nice.... I cannot take anything sweet:( You know how I eat pancakes..with spicy home made Indian pickle. I know that sounds weired but it taste really good with buttermilk pancakes:D.
Pumpkin? That's all you got? I'm still waiting for the Peanut Butter Crunch Pancakes. This sounds like a perfect Thanksgiving morning breakfast! Mmm, I love anything pumpkin! These look great, I may subsitute the whole wheat flour for white flour cause you know me, hate healthy stuff! lol, I suppose thats why I look so healthy huh?haha Thanks! WOW!!! We will have to try those as soon as possible! My oldest son is crazy about pancakes AND pumpkin pie, so I am sure these will go over well in our house! Thanks! These do sound very good! No oil or butter in recipe? Wow these look absolutely AMAZING! I just finished dinner (homemade pizza using your wholewheat rosemary dough recipe, LOVE IT! I've made it like 5x now and each time the pizza disappears quickly before it has a chance to cool down). I was living in Norway but now back in Canada. Thanks for this pumpking recipe...will have to try it someday.. I will be making these. I love all things pumpkin! Hi everyone, Just a quick notice! As JEP pointed out, there was no oil or butter listed for this recipe. Well, that was my mistake! As you probably know, I never leave the fat completely out of a recipe ;-) I have edited the recipe to include the 2 tablespoons of oil that I used when I made them. They would probably be ok without but I loved these pancakes so much, I wouldn't change a thing! Sorry for that! Padmaja: Hi there! I know that you prefer savory pancakes over sweet ones and I like them too! But I grew up eating sweet things like this for breakfast so I will always love them :-) Jason: Hmmmmm...you might be waiting a while. Although some Peanut Butter Cap'n Crunch sounds good right now! Corinne: Yes, it would be good for Thanksgiving but they're pretty filling so it might not be the best idea depending on what time you eat Thanksgiving dinner! The only thing I like to eat for breakfast on Thanksgiving are the sweet rolls that Nana heats up in the oven! Ruby: I knew you would say that! Hahahaha! Try them with whole wheat, they actually taste better I think. Believe me, these aren't 'healthy tasting' at all! Promise :-) Karen: Yes, I think kids will love these pancakes! Let me know if you try them! Evie: Hahahaha! There are lots of recipes on here that use buttermilk if you still have some left over after this one! Jack: It's great to get more feedback about the pizza dough! We eat pizza using that recipe all the time, too! It's very addictive :-) Marie: Great! Let me know how they turn out! Nicole, This is my first time here. I was shown the way via Emon's blog. I must say that your site is absolutely lovely!! Sift proud, sister!! It's truly a thing of beauty and the pictures of your food are so tasteful--and I mean that in more ways than one! Your feta cheese dressing is fantastic. I'd been looking for a good Tzatziki sauce recipe (pardon my spelling..the word really IS Greek to me) and yours looks perfect. I can't to try it. Congratulations on a blog well done, Nicole. It's sublime. I'll be back. LK You deserve Best Food Blog in the Weblog pantheon! I'm voting for you! Sounds very tasty, and I could easily make this SB diet friendly too! Great idea! Yum! I have to try these! Laurie: Thanks for stopping by and for all the wonderful compliments! You should definitely try the tzatziki, it's really good! I found you through Emon's blog, too :-) Curt: I'll admit that Pumpkin Pie isn't my favorite. I will always go for the Apple Pie after Thanksgiving or Christmas dinner! But I do love leftover pumpkin pie for breakfast the morning after. I don't know why, but it somehow tastes better in the morning! :-) Kalyn: Yes, I thought this might be something that could be South Beach friendly with a few adjustments. I think it could turn into a great vegan recipe, I was thinking about asking Susan from Fatfree Vegan Kitchen to give it a try :-) Cara: Thanks, I hope you do! Oh yum!!! I love anything pumpkin...I am actually on the east coast right now enjoying the fall weather and have been going pumpkin crazy!!! I am going to have to try these for breakfast! I keep meaning to add more whole wheat into my diet, and this sounds like the perfect recipe to start with! This is such a comforting fall recipe! Perfect to take the chill off a day like today. These are SO right up my alley. How am I only just now coming across your blog? It's great! Hi Nicole - these look delightful. And since pumpkin and maple are a perfect combination anyway (after having pumpkin bread spread with maple butter I've never gone back) it's the next logical step in breakfast food. I can't wait to try them. Dani: Oh, it must be so nice to enjoy a "real fall!" It's still too warm here in Sicily to really feel like fall. Transylvania was nice because we got to see fall colors and bundle up a bit during the chilly evenings. But now I'm back to t-shirts! Deborah: Pancakes and muffins are the perfect way to start adding more whole grains into your diet...I especially like pumpkin and banana breads and muffins with whole wheat flour. Jenni: Thanks for the links, I'll check them out! I have some whole wheat blueberry pancakes on this site that might interest you, too :-) Brilynn: Exactly! They are very comforting...has something to do with the smells of nutmeg and cinnamon while they are on the griddle! Patricia: Thanks! :-) Dana: Thanks! I'm glad you stopped by, now I've checked out your blog and subscribed, too! :-) Claire: Hi!! Great to 'see' you! Yes, pumpkin and maple go very well together (although I have to admit that I used Mrs. Butterworth's on my pancakes because we're out of real maple syrup). I haven't tried maple butter but now I'm really wishing I had some to go on the pumpkin muffins I just baked! Pumpkin pancakes sound good! And they are also whole wheat making them a bit healthier. Oh, oh, oh, I've just got to try these! Thanks Nicole. Last Sunday I had a hankering for pancakes-- which I'll eat once a year at most-- and decided to go with the whole wheat version in Joy of Cooking. They were SO much tastier than regular pancakes! I was even thinking about making half the batch pumpkin (my girlfriend doesn't like it) but I wanted to keep things simple and traditional since I probably wouldn't be making pancakes for another year. I might have to try these though. wow! just wow! I'm amazed at how easy it was for you to come up with a recipe so quickly! And for those of you who don't live in the US where pumpkin purees grow on trees, we made ours with apple puree and it's delicious. Yeah, it's not very Halloweeny, but still tasty. Thank you Nicole! These sound wonderful! I can't wait to try them! Laura: Thanks for stopping by! I just made these pancakes and they rock! They were a delicious pre-halloween treat! They would be great all year around too! Thanks! I made these this weekend and they were amazing! Exactly what we were looking for. Thanks for the great recipe! I can assure you that I will be making these again in the near future! Hello! I made these pancakes for breakfast this morning, and I thought that they were great! I can't wait to try it out on my other family members. These pancakes are fantastic! I made them for my 2 year old a few weeks ago, and we are already on our 3rd batch. They are now the only thing he will eat for breakfast, and he often wants them for dinner too! I followed the recipe exactly, but II added around 1/4 cup wheat germ and an extra 1/2 cup milk cause we're trying to add extra iron into my little one's diet. Thanks for the recipe! Delicious! They make hearty, delicious waffles and taste great with some maple syrup. 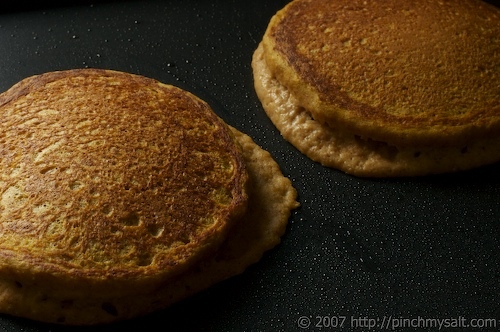 I stumbled on these while doing a google search for whole wheat pumpkin pancakes. WOW!! These are wonderful. I am always looking for new pancake recipes, as pancakes are the fav breakfast of my two girls. They gobbled them up and asked for seconds. I always use the whole wheat pastry flour in my recipes (it is very finely ground), as it does not have that grainy texture of the regular whole wheat flour and my kids never even notice the difference. I can't wait to try some of your other recipes!!! Just wanted to let you know I made these for Christmas Day brunch along with your bran muffins. Both recipes are great. I love whole wheat pancakes and these were so good. I wished no one else had made food so I could've had room for more. My grandma even asked for the recipe. I made 3 batches of muffins. I made a batch of cranberry orange with regular craisins. I didn't care for the flavor of the trader joe's orange cranberries. To get more orange flavor, I soaked my cranberries in warm orange juice. The blueberry batch was delicious. The best blueberry muffin I've ever had. I also make a batch with dried cherries and pistachios which went over really well. Now I am going to go scrounge to see if we can't have punkin pancakes for breakfast today! p.s. the kids all loved the pancakes, all 5 of them from 21months to almost 7 years old. These are great! I make pumpkin waffles often but didn't feel like it today. We had them with pear maple sauce and they were fantastic. I'm looking forward to trying more of your recipes. Thanks! Brings back memories of when I improvised a pumpkin pancake recipe for my kids about 20 years ago. I will try your whole grain version as it sounds delicious. I may even add some wheat germ as we are always looking for ways to incorporate more fiber into our diet. Great blog! I wanted to have a pancake dinner for Fat Tuesday and I came across your recipe. My family and I agree, we could eat these all day! I used 100% hard white wheat and the pancakes turned out great. Thanks! 1 can pumpkin? What size can? This was a great recipe! Thanks for sharing it! I added a tablespoon more sugar and walnuts to the batter - so good. And by the way, when I was looking for a pumpkin pancake recipe I found a bunch, but yours was the only one with a decent amount of actual pumpkin in it. One recipe had 1/2 cup MORE flour but only 3 tablespoons of pumpkin! I just tried these tonight (I was a little slow in making them. lol. ), and I LOVE them!!! So good and filling! Hello, First of all this recipe looks delicious! I do not see anywhere on this recipe how many people it serves? We are trying to make a healthy breakfast for roughly 150 people, can you advise as to how many servings? thanks! My father, who doesn't really care for the pumpkin spice flavor profile, declared these pancakes "not good, but great. A fantastic pancake." Thanks for the recipe! Exactly what I was looking for! I added blueberries and pecans (sprinkle a few on each pancake when you first put it in the pan to cook) and the flavor was great together. I also substituted sorghum molasses for the brown sugar since I was out of brown and wanted that deep flavor - worked perfectly. Thanks for the great recipe! I made your pancakes today and they were fantastic! It was just me for breakfast so I made a dozen muffins with the leftover batter. I used white spelt flour and added an additional 1/4 cup of buttermilk. Oh and I used agave nectar in place of the sugar. Instead of maple syrup we like to dip them in pumpkin butter whipped into low-fat greek yogurt, or for a real treat whipped cream. I'm making these for Shrove Tuesday again this year! I really like that you point out subbing in more whole wheat vs. processed or other. Doctor grandmas delight is my favorite sugar substitute. It bakes really well too. I thought of that because they do whole wheat pancakes and other whole wheat products. I bet they wouldn't be happy about your competition here with a great recipe! Hey...by the way...a nice oil to use would be a light and buttery evoo(extra virgin olive oil) if you want to stay on the healthy side of things;) Thanks for the great post! So this morning I got up early to bake a cake for my best friend's birthday that we are celebrating tonight... and it called for 1.25 c of pumpkin. As I was putting everything away, I realized that I could use that left over pumpkin, plus some leftover buttermilk from last week to make some pumpkin buttermilk pancakes... I hopped online to look for a recipe and found this one... Started making them at 8:37, was eating by 8:50 and now at 9, I'm about to go meet some friends for breakfast... HA! But I know that I have eaten healthier than I could ever get at a restaurant, it's cheaper this way, products in my kitchen didn't go to waste, AND I get to play with their kiddos while they eat... I think I consider this a win-win-win-win! Thanks for the great recipe! Wow, made these today for Rosh Hashanah breakfast. YUMMY! Not too sweet. Really nice pumpkin flavor. My 9 month old baby and hubby loved these. Keep these recipes coming! These were great! Add in some crushed Pecans for Pumpkin Pecan Pancakes! Also, You can start with a fresh pumpkin by just making puree in the blender with the required amount of milk and pumpkin... Thanks for a great recipe! These were SO good! I made them with my boyfriend this morning and they hit the spot! After the always ugly first bath we added a bit more cinnamon and nutmeg and more salt. But great recipe! Thank you so much. I had a partial can of pumpkin in the fridge left over from making pumpkin cookies and got a hankerin' for pumpkin pancakes... I found your recipe which sounded the most like a regular pancake recipe and not some crazy gourmet thing, which I'm not necessarily opposed to but it wasn't what I wanted today. They were very yummy!! I had to add a bit more milk only because the batter was super thick but it was all good. Thanks for sharing :D Oh, and by the way a friend asked for the recipe and I posted the link on my facebook page. These are great! I tryed making them with zucchini instead of pumpkin(I had lots of zucchini coming out of the garden), and they were delicious. I'm making them for this Thanksgiving breakfast. We just finished eating these pancakes – outta sight! I was surprised how well (and quickly) the pumpkin cooked through; and maple syrup seemed to bring all the spices forward. Wonderful! I didn't have dried ginger, so I used a big nub of fresh ginger root, peeled and then pulverized in the Cuisinart. (I also tripled the cinnamon and added clove and allspice. I'm a sucker for the Thanksgiving spices, even – or especially – in February.) I'm adding these to my pancake repertoire, and I'm adding you to my blogroll, if you don't mind, Nicole. Fantastic site! Wow! These were awesome! There was a favorite recipe we used to use from allrecipes but once we started eating healthier and tried whole wheat it just wasn't as good. I just googled it and saw your recipe. I used all whole wheat and it still puffed up so nicely. The kids and hubby love it! I made this in a waffle iron and they turned out great! Thanks for sharing! HELP! I was so excited to make this and they were a terrible disappointment. May be several reasons for this: I used the all-purpose instead of cake flour--sifted 4x; I used soured milk-by adding lemon instead of buttermilk; my canned pumpkin may be different than yours; pie spice instead of individual spices. Now, have you made this with the all-purpose? Does your cake flour have rising ingredients in it? What is the consistency of your pumpkin puree? Mine was very very dense-holds the shape of the measuring cup. The batter was extremely thick. I had to almost double the liquid. They came out doughy, not the light fluffy ones in your pics and bland. Also, I notice a lot of people commenting before actually trying these. Can we get more feedback from those of you who have actually tried these? What is your experience and did you vary the recipe at all? I really want these to work next time. Thanks! I just made these for Sun breakfast exactly as written except with just plain all purpose flour. The batter is very thick and fluffy. I cooked slowly and they turned out with very good restaurant-like consistency. My pumpkin puree from a can was moderately fluffy. I couldn't dump it onto a plate and have it hold its shape, but it would still stay in a lump. My guess would be the combination of too dense pumpkin and too much milk would make them doughy. So these were quite good. A mild spiciness that didnt overpower the pumpkin. My only desire would be to be able to use 1 egg and 1 egg white instead of two eggs to cut cholesterol and fat. I'll try that next time. After that, Ill try low-fat milk with some vinegar instead of buttermilk to also cut fat, but my guess is this will change the taste and perhaps consistency with less fat. Just wanted to say thanks. This recipe is a WINNER! I cooked some fresh pumpkin last night and let it drain overnight. This morning I made your delicious whole wheat pancakes. I used bread flour instead of cake flour, added a pinch of cloves, and used a mixture of yogurt + milk for buttermilk. Oh my, I am most definitely making these in the morning! Thanks, Nicole! I made these this morning. Needed to make them dairy free, so used coconut milk instead. I did add a little extra to thin the batter. I also used turbinado sugar instead of brown sugar. They were delicious... the 100% maple syrup made them perfect. Just discovered your blog and made these this morning. I added 1/4 cup flax seed for a little extra nutritional value and some nutty flavor. Super delicious! Have already added you to my favorites! Can't wait to check out more of your recipes. Thanks!! This recipe was absolutely fabulous. Adding extra buttermilk was definitely the key! breakfast foods should always be high in carbohydrates to provide the energy you need in the mornign .. These were delicious! I even used all whole wheat flour (the regular kind, not the white whole wheat) and they weren't dense or anything. Absolutely delicious! How many was this supposed to make, though? I think I got six large and thick pancakes out of it! I just made these with my two year old's help. We made it with all whole wheat (and chocolate chips). They were very light and fluffy despite the extra whole wheat and extra 2 year old stirring. My husband gobbled them up even though he hates pancakes and my son loved them too. I love them because they have more nutrients than standard pancakes and not too much sugar AND the fam eats them! Thank you for making nutrient rich cooking fun and yummy. when i cook at home, i always make sure that i only cook healthy recipes because i don't want to get fat `;"
I made these this morning. My family gobbled them up. I used all whole wheat that I ground myself. I also added more buttermilk and used sucanat instead of brown sugar. they were light and delicious! This recipe made 22 smaller pancakes. breakfast foods should always be high in protein and also in carbohydrates, we need food energy during the early morning ;~"
My friends and I had to get up very early this morning to get set up to run a workshop. I wanted to make them something special before our big day, and I just happened to have about a cup of cooked butternut squash in the fridge, so I decided to make these. They were absolutely delicious! I left out the brown sugar (sort of forgot, to be honest), added a little less squash/pumpkin (I simply ran out), and a little extra buttermilk (my batter was a bit thick). I made them entirely whole wheat, and they went like hot cakes! Went wonderfully with some fresh brewed espresso and homemade pure maple syrup on top. YUM! Will absolutely be making again!! 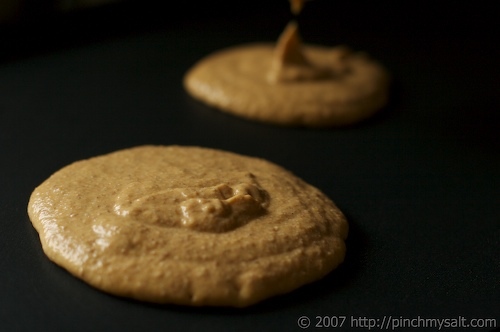 Looking for a whole wheat pumpkin pancake recipe and stumbled across here. Had these over the weekend and they were PERFECT! The only thing I changed was adding chopped pecans, and since I didn't have buttermilk, I used skim milk with a little lemon juice. If I had more than two thumbs, they'd get four thumbs up. Thanks! After using this recipe for my whole-wheat pumpkin pancakes many times, I finally realized I've been missing out by not adding this blog to my RSS feed. Thanks for your posts! This is very tasty, I already tried it. We so appreciate your blog post. You will discover so many methods we could put it to proper use with the help of minimal effort on time and hard earned money. Thank you very much pertaining to helping have the post give light to many problems we have had before now. Found your website when I googled healthy pumpkin pancakes, and boy am I happy I did! These pancakes were fabulous, used all-purpose flour instead of cake flour, and had to substitute sour milk for the buttermilk, but turned out wonderfully! I think these are my new favorite pancakes. Looking forward to checking out some of your other wonderful looking recipes. I stumbled on your recipe, and I loved it so much I did a version for Hodgson Mill blog. I wanted to thank you for the inspiration! Your site is fantastic. Recipes, photos . . .everything. Thank you! Really good, thanks for getting distracted from your French toast! I'm on the weight watchers diet so having the nutritional information for a recipe is a great help. Can you add the nutritional information? My parents are coming to visit this weekend and I am really looking forward to making this pumpkin pancake recipe! I know you said to double the canned pumpkin if you have a large family, but I was wondering approximately how many pancakes the original recipe makes? I'll be cooking for four. Thank you! 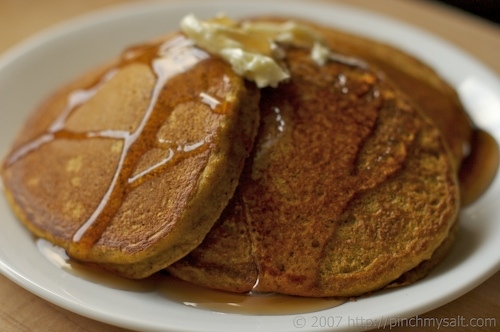 We just made pumpkin pancakes too.. you might like our version it has rolled oats! You can find it here: http://thedealgirls.com/?p=6755 Thanks for sharing! These are so delicious!! I completely forgot to add the oil and they were still perfect! I added about 2 tablespoons of flaxseed and all whole wheat flour. These are great!